Since the dawn of Taste Test, only a smattering of the dozens of products that have made their way into our laboratories have caused outright disgust and avoidance in your intrepid tasters. The briny, swine-y siren call of pickled pig lips drew only a few brave souls, and the one and only Internet Eating Sensation Dave Chang was the only one who stepped up to take on Chicken In A Can (by candlelight, no less). But nothing has sent as many tasters scurrying away as today’s entry; even Chang balked, eventually backing down only after months of wheedling from Chief Instigator Josh. What could strike so much fear into the hearts and stomachs of The A.V. Club’s roster of hardened, professional(ish) tasters? 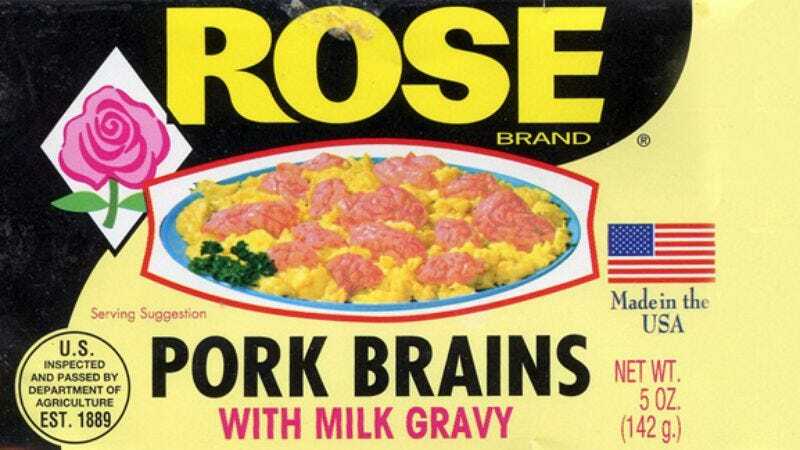 Nothing less than the favorite delicacy of zombies and naegleria fowleri: brains. Canned pork brains in milk gravy, to be exact, in keeping with our ongoing quests to one day collectively consume an entire porker and eat anything and everything commercially available in a can. Consuming said organ meat during the height of swine-flu mania only amplified the sense of danger/stupidity (and the opportunity for nervous joking), but the real danger of pig brains lies in the nutritional information label. That’s right, 1,060 percent of the recommended daily value of cholesterol. In a package smaller than a tuna can. Surely something so decadent must hold some hidden taste treasure—a vaguely taboo, naughtily delicious delicacy on par with foie gras or veal, right? We might like ’em? Who could resist such a tentative endorsement, delivered with such folksy punctuation? You’re on, Coble! To complete this breakfast of the damned, we augmented our Brains N’ Eggs with a can of Beverly brand bulk sausage, because nothing says “balanced breakfast” like a puree of beef tripe, pork stomachs, beef, and beef heart floating in a pool of salt, vinegar, spices, and sodium nitrite. After all, what better way to start the day than with a massive coronary? Mmm, invigorating! Because we somehow foresaw the need to wash these tastes out of our mouths and erase them from our brains as fast as possible, we had a six-pack of Chang brand beer (Thailand’s Favorite Beer) at the ready. Please note: IES Dave Chang does not officially endorse Chang beer—but he’ll drink it, because he’s the Chang. We also rewarded ourselves for a disgusting job well done with a slab of the best part of a pig: bacon. Specifically, some delicious Boss Hog bacon that arrived mysteriously in the mail from baconfreak.com earlier that morning, along with a bunch of other bacon-y goodness that you’ll see in future Taste Tests. Clearly, the pork gods saw the sacrifice we were about to make and saw fit to reward us. Only a handful of brave souls manned up and faced the brain, though everyone but Chang and Brett opted to go the Brains ’n’ Eggs route rather than eat brains straight from the can. Our courage wavered a bit once the can was popped open to reveal soggy pink chunks floating in a milky pink liquid, accompanied by a smell very akin to cat food and dead tissue. But Chang gamely popped a wiggly chunk into his mouth, proclaiming it not terrible enough to inspire him to go back for a second bite. Brett’s reaction was a little more relatable for us non-Internet Eating Sensations: horror accompanied by repressed gagging. Where to get it: Assuming you want to, Rose and Beverly brand products are reportedly available at several grocery stores, mainly in the South. If your local grocery is not stocked by sadists/zombies, do what we did and get it online: shopfoodex.com has them both.